The New Zealand Weddings Show at Fashion Week was filled with surprises and highlights. He'll make a damn fine groom, one day. 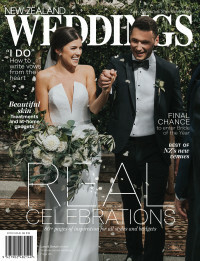 The Kiwi personality – who has been in a #couplegoals relationship with his chosen bachelorette, Matilda Rice, since 2015 – looked a dashing picture as he walked the runway in a Working Style suit as part of the New Zealand Weddings Magazine Show. Confident in a classic black tuxedo, the owner of CleanPaleo food brand and fitness ambassador was all smiles – particularly as he walked past his gorgeous girl, who was sitting front-row.